We’ve all been there, оur moms got cross-sold to (because of us). Cross-selling and up-selling make up a big chunk of the revenue online stores generate. And there’s no reason they should not work for you (if done right). So let’s explore cross-selling and up-selling and go deep into how you can implement them into your strategy most effectively. Cross and Up – selling naturally share the same family tree. That would be the “Selling” family tree. Buying a chicken from me? I can offer you a better chicken for 20 bucks more! In this case the better chicken would be an up-sell. Or you can get a water container the chicken can drink from for 10 bucks more: that’s a cross-sell. Up-selling is the reason we end up with 128GB phones and 60” TVs instead of 64GB phones and 48” TV’s. It’s also the reason why we buy premium accounts for digital products, instead of just pro accounts, etc. Cross-selling, on the other hand, is why we buy things just in case. You’d cross-sell products that are related to the ones the customer already owns or is about to purchase. You just bought that 60” TV, how about some extra batteries for the remote control? Maybe a mouse, keyboard or headphones for that new laptop? Sure! 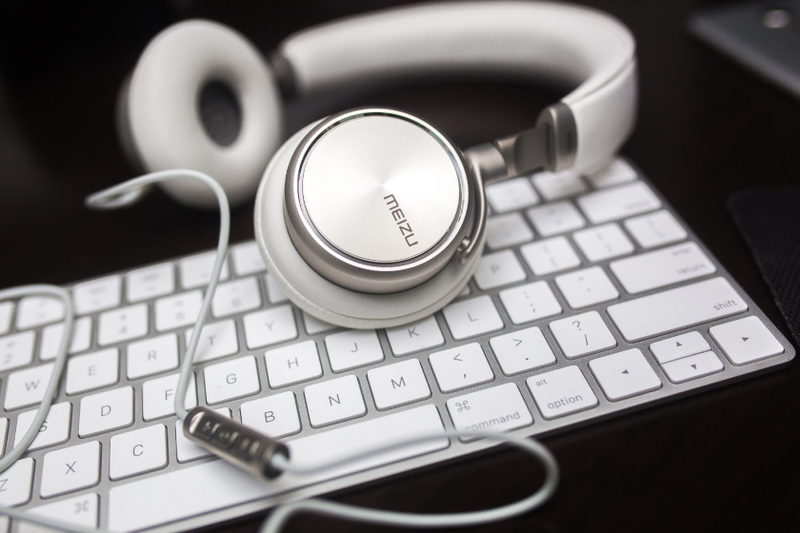 Why are Up-selling & Cross-selling important to eCommerce? Most people just hate being cross-sold or up-sold to, you think. Some might even say they are unethical tactics meant for businesses to squeeze more money out. However, that’s not the case, as many marketers would agree. For example, let’s take the kid and mother from earlier. It seems unethical, because the mother is not particularly happy buying just about anything that her kid finds appealing. However, she is not the target customer, the child is. Sure, both techniques can be used in pushy and unethical ways, but customers nowadays are more sophisticated and such strategies don’t last long. If you implement cross-selling and/or up-selling in your strategy it should be used in a friendly “helping the customer decide” way. If you cross-sell and up-sell right, you will naturally see an increase in your AOV (Average Order Value). This makes perfect sense as you’d be selling more. If you cross-sell you’d bump up the order value a bit with an extra item, if you up-sell you’d do the same but by selling a superior product. Marketing research on customer loyalty also shows that your chances of selling to an existing customer are between 60-70% whereas the chances of selling to a new one range between 5-20%. So up-selling and cross-selling to existing customers can boost their LTV (Life-time Value) and of course their Order Value. Like mentioned above, many people don’t quite know what they are looking for until you show it to them. Sure, they know what problem they need fixed, but do they know the best solution? Make sure you show it to them. Let’s assume you’ve just up-sold like an absolute pro. You managed to give your customer a better solution to his problem and now they feel quite positive about you as a brand → they are likely to come back and purchase again. Return orders generate up to 43% of your revenue, so make sure you become good friends with your customers! Analyze the behavior of your buyers before implementing any cross-selling or up-selling strategies. You might be surprised to find different correlations between customers and products, such as noticing that customers who buy product A tend to also buy product B after a certain period of time. 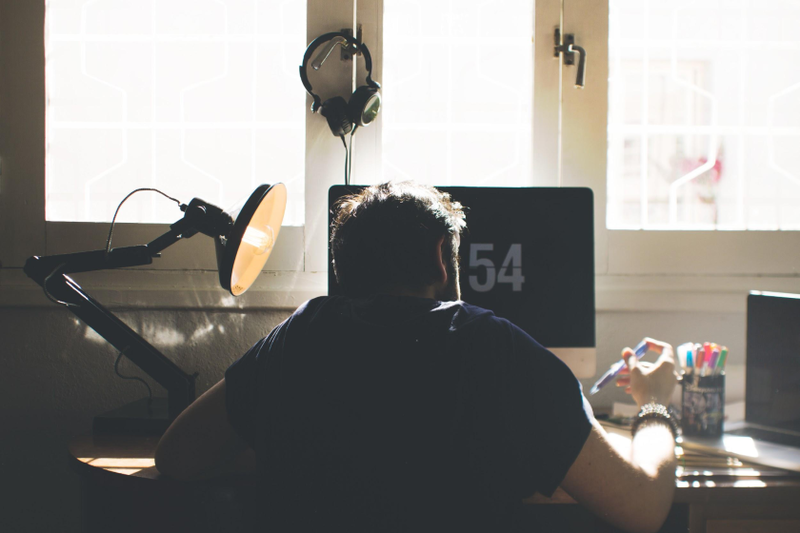 Finding such tendencies can help you cross sell more effectively. Being aware of such buying patterns can help you put in place a rock-solid cross-selling strategy by offering people the product they will inevitably buy at a later point in time. Example: Let’s assume Joe is a customer of yours. You would naturally want to meet Joe’s needs each time as he is a profitable and loyal customer. How can you do this every time? Well, you have to get to know Joe, without meeting him. Well, you know what and when he’s purchased, right? You already know how he behaves on your site, you know how he responds to your emails, you also know what and when he is likely to buy next. You also know Joe is not an impulsive buyer as he plans his purchases carefully. He usually does not respond to your cross-selling efforts on site, nor does he respond to your up-selling offers, as he’s already planned out his purchase. However, Joe always opens your e-mails and clicks on your offers, because he knows there might be something valuable in there. So why don’t you try to cross-sell to Joe by e-mails? Your “Thank you” emails to him can contain some relevant product recommendations (maybe he missed something). You could also add a special coupon for him to use, should he decide to buy. In an ideal world you would like to keep an eye on Joe’s Average order value, what and when he buys and how he responds to cross and up-selling offers. Knowing his Avg. order value, you could in a way fit your cross and up-sells into his avg. budget. If Joe really plans his purchases and is not an emotional buyer, then maybe he has strictly allocated funds for certain products. Respect that and try to suggest products that would fit in and around his budget. You can read more about important eCommerce metrics here. How & What to Up-sell? Research shows that 4% of people take the bait on an up-sell, which means you don’t have much room for mistakes, you need to nail it. Those are people who don’t just look for something that is “good enough”. Those 4% are ready to purchase something that will solve their problem. They are ready to walk the extra mile and find “the right fit”. Bonus tip: Always make sure that you are suggesting a product from the same category. Don’t offer a person a desktop computer is he is looking at a MacBook. They simply don’t serve the same purpose. Even though up-sell and cross-sell are pretty similar, up-selling is believed to be the better option when doing business online. According to research, nearly 4% of all the people who were exposed to an up-sell, went for it. When it comes to cross-selling the figure would be 0.5%. However, cross-selling is king on checkout pages. Conversion rates for cross-selling on checkout pages go as high as 3%! According to Paul Rouke (see below), customers are more susceptible to cross-selling on checkout pages, because this is where they know what their exact order value is, including delivery costs. So you might want to A/B test your product pages. One version would have cross-selling, the other won’t. It might turn out that removing cross-sells from the product page would increase overall conversion. Then you might also enjoy some extra conversions from cross-selling on your checkout page. A perfect way to boost sales! Customers and online shoppers in particular are becoming more sophisticated with each day, but there are some basic behavior flaws for you to exploit. People make irrational decisions and this is nothing new. It’s just in our nature. We like having many options, but we also tend to find it hard to make a choice when we are bombarded with too many of them. Let’s dig deeper and see how you can take advantage of these behavior flaws. People like having choices, it makes us feel somewhat superior. We have all these things to choose from, we must be special! However, it’s also hardest to make a decision when you are blasted with options. 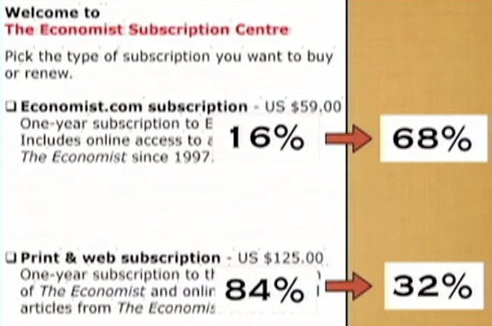 Research published in The New York Times shows that narrowing people’s choices can help you increase conversions. Therefore, always narrow options for up-sells. Simply flashing different products in front of customers who’ve already said “no” to an up-sell won’t help you. This is where bundles can work well for you. All of us go through some decision-making process while shopping (online or offline). This process is usually broken down into a few steps and because we spend energy on each step, we might say no to a couple of cross-sells and up-sells, but sometimes we see bundles. We like bundles, we get more stuff for a slightly bigger price. It makes us feel like we’ve struck a deal. If you’ve ever haggled for something, you’ll know what I’m talking about. These two for $50 each? No, I’ll give you 70 for both. Done! So use bundles to reduce the complexity of choices people have to make. Make life easier for them and make them feel like they are striking a deal. They’d be happy to take it! People tend to make irrational decisions. Sure, we like to think that the decision we made has been thought out, but in reality we rarely make truly rational decisions. There are a lot of interesting studies out there that point this out: in most cases we are just not in as much control over our own decisions and actions as we think we are. Preset options left either checked or unchecked would remain as they were in most cases. For example, a person buying a product online might have some additional options to choose from, special packaging for instance (+$5). If this option is left checked in advance, most orders would probably go with the special packaging. If the option is preset as unchecked, most orders would go without the special packaging. Here’s a study that backs this up. 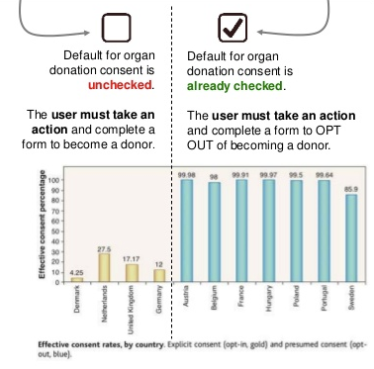 The study goes on to talk about organ donations (yes, human organs) and it clearly shows that people just don’t make rational decisions and usually tend to go with the flow. Dan Ariely proves that people tend to act like this no matter where they come from. People from different countries behave the same way. Looking at this without knowing whether or not the check-boxes were pre-set as checked or unchecked, you’d think that people from Denmark, Netherlands, UK and Germany are ice-cold and don’t care about others at all. However, when you find out their options were preset, you would see that everyone has behaved the same way, meaning everyone was more or less lazy to take an action and actually uncheck what has been ticked (except a bunch of people in the Netherlands). This shows how little we actually think and act in such situations. In eCommerce and business in general, you could easily take advantage of this by leaving such options checked or not (it’s up to you) by default. Sure, it might seem a bit unethical, but at the end it comes down to what the buyer will do. But it works. After all, who in their right mind would opt for the less attractive offer that comes at the same price as the superior one? Exactly. The second option is a dummy choice and it’s there just to make you go for the superior one. You can see what they did. 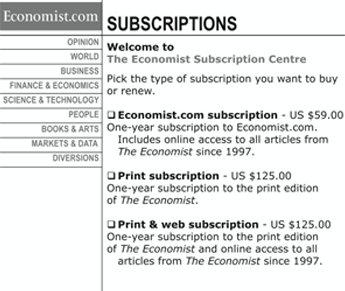 Clearly people have 3 options – Web, Print and Web + Print subscriptions. The Print subscription is clearly the dummy choice, as it comes at the price of the superior offering (Web+Print for $125). What did people choose? Well, Dan Ariely took 100 MIT students and showed them the ad. What happened then? 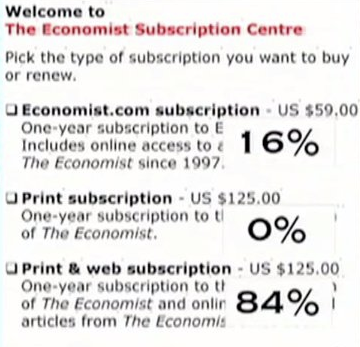 It’s easy to see that the vast majority went for what is considered “the best option” here – Print & Web subscription. Nobody (literally nobody!) went for the dummy choice! What would happen if the dummy choice is simply not in there? Will people still go for “the best option”? Surprisingly (or not), this time the majority went for the cheaper option. “The best option” that had received 84% when the dummy choice was around, now has only 32% of people opting for it. An inferior choice (dummy) makes a similar and superior one look more appealing even if there are cheaper offers too. As you can imagine, there are folks who find these tactics unfair and wrong, and in some cases they are right. After all, there are a lot of businesses who do whatever they can just to squeeze more out of your pocket. So there is a very fine line that separates the creeps and the friends. How to be The Friend? Many businesses still go for the “in your face” method of cross-selling, which ends up in a long and utterly exhausting and unpleasant 10 (or so) step process. Nobody likes this. This is what would qualify you as the creep. Show and tell your customers that you have a pre-checked add-ons and extras. Don’t hide them with the hope they won’t notice. Don’t blast visitors with cross-sell and up-sell offers. Instead, give them relevant suggestions based on what they tend to like and buy. If they say “no”, just don’t push it any harder. Suggest up-sells on product pages, when a customer has viewed and picked a product; don’t throw up-sells at them beforehand. Try to keep cross-selling friendly. Include it on the checkout page when people already know what their final cost would be. The key takeaway here is: cross-selling & up-selling should be used as tactics to help customers make the best possible decision in a short period of time.